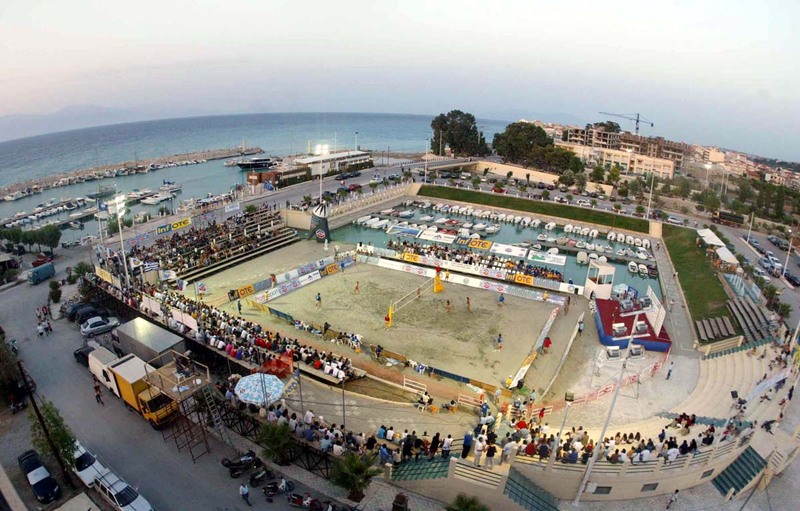 Xylokastron, Greece, August 28 – The first edition of the 2002 FIVB Under-18 Beach Volleyball World Championships started on Wednesday here in the northern Peloponnese with the women’s qualification round. Some one hundred players from 20 countries will battle it out for the first Under-18 World Championship title, to be decided this weekend. For most of the young athletes, it is their first appearance on international sand and the excitement among them is palpable. After the success of the first Under-21 Beach Volleyball World Championship last year at Le Lavandou, France, the FIVB decided that staging annual World Junior Championships was an investment in the sport’s future. “We know that this is the most effective way of encouraging the next generation of players,” said Angelo Squeo, FIVB Beach Volleyball Co-ordinator. In July, the Under-21 Championship was held in Catania, Italy. Xylokastron was chosen as host city because of its valuable experience in organizing international Beach events, so much so that the city fondly refers to itself as Greece’s ‘capital for international Beach Volleyball’. “We continue our now long-standing tradition of international events in our city and it is a great honour to host such an important competition,” said Mayor Dimitris Skouras. Xylokastron is a popular summer resort for Greek holidaymakers on the northern coast of the Peloponnese, some 115 kilometres west of Athens. The exceptional combination of the crystal-clear waters of the Gulf of Corinth and the lush vegetation of the mountains that rise behind it, make the Greek town a popular holiday resort. Thus, the permanent population of 16,000 swells to over 30,000 on peak summer weekends, which will guarantee large numbers of spectators flock to the Championship. Players will compete in six pools of four teams for each gender with the top two plus the four best-ranked third placed teams qualifying for the 16-team Single Elimination Bracket, starting Saturday. Matches on the first three days will be played in morning and evening sessions. The four winning teams will receive Wild Card entries to compete in one of the Beach Volleyball World Tour events, all expenses paid. The under-18 championships Men & Women, a first for Beach Volleyball, are to be held at Xylokastro from 28 August – 1 September. The northern Peloponnese resort of Xylokastro, located some 115 kilometres west of Athens, continues a now long-standing tradition of international beach volleyball events. Following very successful seasons with European Championship tournament, plus FIVB World Challenger events that attracted huge crowds, Xylokastro will inaugurate this year the FIVB Under-18 World Championships. After the overwhelming success of the first under-21 Beach Volleyball World Championships at Le Lavandou, France, last year, the FIVB decided that staging annual Junior World Championships was the most effective way of encouraging the next generation of players. The four winning teams - men’s and women’s teams from each championship - will be awarded all expenses paid, wild card entries to compete in one of the 2002 Beach Volleyball World Tour events. “Beach Volleyball is gathering popularity in many parts of the world and we want these important junior world championships to reflect that international flavor,” Squeo said, adding that the FIVB encouraged participation by players from all five continents. The main draw will feature six pools of four teams (24 teams) playing a round robin format. The top two teams from each pool, plus the best four ranked third-placed teams (16 teams) will then play a single elimination final phase to determine the World Champions.